So you want to buy a table tennis table? It’s not an easy decision. There’s a lot of choice available. Different brands, different quality, different prices. What’s a good table? What’s a load of rubbish? Should you buy cheap? Or spend a small fortune? Hopefully I can help you. In this blog post, I share advice about how you can tell a good quality table from a poor one, which brands are best, how much you should spend and where you can buy. I also give specific recommendations on which table tennis tables to buy for your home, club and school. The easiest way to identify whether a table tennis table is any good is the thickness of the table tennis top. The thickness will range from 12mm to 25mm. Thicker = better quality. Thinner = worse quality. You should avoid buying tables with a really thin table tennis top (e.g. 12mm). The ball just doesn’t bounce very well and the tables are flimsy and easy to damage. Tables with a medium thickness (16mm-19mm) are actually ok. I have a 19mm Butterfly Easifold table tennis table in my garage, which is absolutely fine for my purposes of a training with a robot. You will get a consistent bounce and if you look after the table, it should last for many years. Tables with thick table tennis top (22mm-25mm) are definitely the best. But they are also the most expensive. If you’re an amateur player, you probably won’t be able to tell much difference between 22mm and 25mm. The quality of 22mm is fantastic. 25mm is just that little bit better. There are a number of very good table tennis table manufacturers. Over the years I have played and coached using tables from the following brands and the quality has been very good: Butterfly, Andro, Joola, Cornilleau, Donic, Sponeta and Stiga. How much does a table tennis table cost? You buy a very cheap table tennis table for £100. You should avoid these tables as the table top thickness will be thin and the quality poor. They’re cheap for a reason – they’re not very good. You can buy a medium thickness table (16-19mm) for £200-£300. This is probably the minimum you need to spend to buy a table which is going to give you a decent bounce and last a few years. Competition quality tables (22mm-25mm) will cost anywhere between £350 and £1000+. These tables are great to play on and will last a long time, but obviously much more expensive. Where can you buy a table tennis table? Most table tennis shops will sell tables, as well as rubbers, blades and balls etc. Take a look at my list of table tennis shops in UK, Europe, USA, Asia and Australia to find a shop near you. If buying a few tables, you can usually negotiate a good deal. You can also find good deals on Amazon (UK site | USA site). Whether you buy from Amazon or not, it’s a useful site to visit, as you can read lots of user reviews to help you make a decision. If you have a limited budget, you can find some great second-hand bargains. People are always getting rid of table tennis tables (some hardly used) for a fraction of the price they originally paid. Take a look at action sites like eBay or local websites and newspapers. Now let’s look at some specific recommendations on which table tennis tables to buy for your home, club and school. There’s usually two main reasons why people get a table tennis table for their home: (1) family fun or (2) serious practice. Let’s look at both scenarios. If you want to buy a table tennis table for a fun family activity you really don’t need to buy a super expensive table. If you’re playing just for fun, you really won’t tell that much difference between a 16mm £200 table and a 25mm £1000 table. So I would just go for the cheaper option. Note that I say ‘cheaper’ and not ‘cheapest’. You should avoid the really cheap tables, e.g. a 12mm £100 table. These are flimsy and the ball doesn’t bounce very well. A 16 or 19mm table will be much more durable and be better to play on. 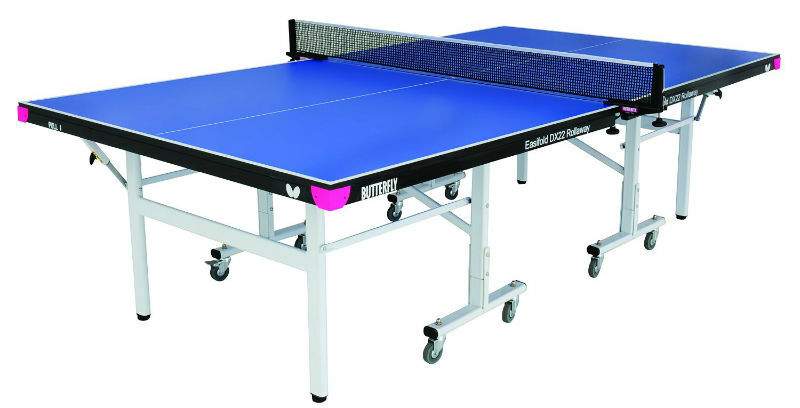 If you want to buy a table tennis table for serious practice at home, then I would recommend getting the best quality table you can afford. The minimum quality you should buy is a 19mm table. I have a 19mm Butterfly Easifold table tennis table in my garage which I use with my 2050 RoboPong robot and it is perfectly decent. Would I like an even better table? Sure. But it’s all I could really afford at the time, and actually, it’s fine for using with a robot. If you do have a bigger budget, then I think it’s worth buying a better quality table. The bounce and speed of the table will be more consistent with the tables you play on in your table tennis club. For more advice and recommendations, take a look at my blog post Tips on buying a table tennis table for your home. For more advice and recommendations, take a look at my blog post Tips on buying an outdoor table tennis table. BEST-SELLERS: Also, take a look at my list of the most popular table tennis tables purchased by readers of my website. Table tennis tables in clubs get used a lot. So it’s worth buying the best quality tables you can afford (preferably 22-25mm). I have helped run table tennis clubs in London and Cambridge and it is always the cheaper tables which need replacing more frequently (or they just sit in the cupboard gathering dust). The good quality tables last for many, many years. So in the long run, it is the more cost-effective option. Also, players at clubs want to play on good quality tables. If you want players to keep coming back to your club, make sure you have decent equipment. It’s a frustrating experience going to a club for some practice and ending up on the dud table where the ball bounces funny. If you’re looking to buy more than one table for your club, I recommend looking at this table package from Bribar. You can get heavily discounted JOOLA 22mm tables, plus nets, balls and bats. It’s a very good deal. From my experience, table tennis tables in schools can take quite a battering! The school kids will bump them, bash them, kick them, smash them, sit on them and stand on them. The cheaper tables just can’t take this level of abuse and will quickly get damaged beyond repair. So you should get the best quality tables you can afford. Ideally you should buy 22-25mm tables. They don’t necessarily have to be brand new. If you can get second hand tables at a more affordable price – great. But make sure they are sturdy tables with a thick top. Bribar have a range of affordable table packages. You can buy heavily discount JOOLA 22mm tables (or 19mm tables if you want something a little cheaper). They also have discounts on outdoor JOOLA tables. With all of their table packages you also get nets, bats and balls. It’s a very good deal. Take a look at all the Bribar table packages. Whatever you decide to buy, just make sure you look after it. If you treat your table well, it will last a very long time. Keep it clean, store it in a place it won’t get bashed and take care folding and unfolding the table. If you do all of this, you will be able to enjoy playing on the table for many years. I didn’t know there were different thicknesses to look for when buying a tennis table. I can see why getting one that is thicker can help you keep it for longer. I will make sure to look for this feature as I look for the best tennis table. Thanks for you effective guide. I love this table. I have always wanted a Butterfly table but could not afford the prices for a premium table. This was a good compromise. It feels very sturdy and the ball reacts more like the premium tables. Thanks – plenty of useful advice, but a clarification please. I am trying to decide which table to buy for use with a robot for practice at home. I am an average standard club player wanting to improve. I keep hearing that if the table is kept in the garage it should be an outdoor model. But then I read that outdoor models give an inferior bounce. How is your indoor model coping with garage conditions, or is your garage particularly well protected against damp? Help! My garage isn’t particularly well insulated and no heating. We also keep the washing maching and tumble dryer in it, so plenty of moisture floating around! I honestly haven’t had any issue keeping my indoor table tennis table in these conditions. There has been no deterioration (I have had it for 4 years). Unless your garage is in a really bad state and you have water leaking in from outside, an indoor table should be fine. If you’re worried at all, you could buy a cover to keep the table protected. Happy to help. And definitely worth getting a net with the robot. It’s just no fun picking up 100 balls off the floor every few minutes! Hi Tom – your table advice is really helpful – thanks! 1. which is the better choice of colour for the table, green or blue? 2. Indoor table in a garage – I see your reply to Mike above, your garage sounds a bit like mine, except we don’t have washing machine in it, we have no heating and no insulation, otherwise its very weather proof. I did read somewhere on line that an indoor table should be kept more or less at a constant temperature, in my garage it can be freezing in winter, and quite warm in summer! I don’t suppose you can say more much more than you have said to Mike, maybe you can comment on the quality of outdoor tables Vs indoor? 1. It doesn’t make any difference in terms of table quality if you get a blue or green table. Both are fine. It’s personal preference really. 2. Really cheap table tennis tables are more likely to suffer changes of temperature, but better quality tables will be fine (in my experience). Outdoor tables are slower than indoor tables and the bounce will be slightly higher. Outdoor tables are a bit sturdier. Personally I would go for an indoor table, unless you are planning to use the table both indoors and outdoors. This is a great article – lot of useful advise. A follow up question. You’ve mentioned that the maximum table thickness is 25mm. However, I am looking into the Joola DX30. It is about 31mm. It seems to be discontinued, and not widely available. And, probably as a result seems relatively cheap at $449. I am wondering if there is a catch. I have to admit that I do not know too much about this table. But I have just done some research and it seems genuine. The price is great and reviews on Sears are very good. So if they still have stock available, I don’t see any reason why you shouldn’t buy. Thanks a lot, for your advice, Tom. Thanks for your seemingly very independent article – I was following your advice and about to buy a butterfly table for myself and family when the website strongly suggested I consider a Gallant Knight table as it brakes on the wheels and a scratch proof frame. It certainly looks good. I can find very little info on this Chinese brand – Do you have any advice or experience? Lower quality Chinese product or great quality and value from the table tennis superpower? I don’t know this brand personally, but I followed your link and it seems absolutely fine to me. If you’re just planning on using at home, this table will be absolutely fine. Go for it! Thanks for the great article. I have been researching to buy my first table and I have a budget. My budget is probably $200 max. (preferably under) I found this table for under $100 and it seems to be fine, but the thickness is only 15mm. Do you think this this is worth it. If not could you please recommend a table for me. Sorry I forgot to leave the link. Here it is. This table does look a bit flimsy to me and has mixed reviews. It is very cheap for a table tennis table so the quality won’t be great. But if you want something for just a but of fun, I’m sure it will be ok. If you want a better quality table I recommend getting one of the tables mentioned in this blog post. I think I will get it because I am just playing for fun and it looks as if it could store quite easily. Really a very gud guide in selecting a table tennis. I have a similar doubt in selecting indoor / outdoor table (as mike and david). Im planning a indoor table (19mm) and then store with a weather proof cover after the game. Hi Raman – if your space is exposed to the elements on two sides, I would definitiely get an outdoor table. An indoor table with a cover will still suffer from changes of temperature in those conditions. Outdoor tables are still ok to play on, as long as you buy a decent one. Good luck! Hi Tom- Thanks a lot for your valuable suggestion. In continuation with my earlier query, even if i fold the table and cover with a tarp type cover wont protect the table.? Yes, a cover would protect the table from the rain, but an indoor may still suffer from changes in tempertaure. If it gets very cold or very hot, the wood of an indoor table can sometimes become warped. This is a 15mm table which would merely be used at home for fun. Any comments you could kindly make? Hi – I’m not familiar with this brand, so wouldn’t like to fully endorse. But from the specs on the website it seems decent enough. And the price seems about right for a 15mm table. Thank you Tom. In my club, we use a lot of Joola and Cornilleau table. We also tested the bounce before buying any new table.